Associated Anesthesiologists, P.C. » Hachiya, Ronald W., M.D. Home / Hachiya, Ronald W., M.D. / Employees / Anesthesiologists / Hachiya, Ronald W., M.D. Ronald W. Hachiya, M.D. is a native of Wichita Kansas. Dr. Hachiya completed his pre-medical undergraduate at the University of Nebraska in Lincoln with a BS in Life Science in 1983. Dr. Hachiya then completed his medical school at the University of Nebraska Medical Center in Omaha, in 1987. Dr. Hachiya completed an internship in 1988 and then he completed an anesthesia residency in 1991, both at the University of Kansas Medical School. Dr. Hachiya is married and has two sons and one daughter. 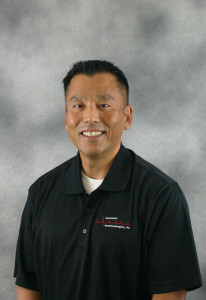 Dr. Hachiya personal interests includes sports, husker athletics and spending time with his family. Dr. Hachiya is Board Certified by the American Board of Anesthesiologist. Dr. Hachiya is the nephew of Keay Hachiya, MD, one of the founders of Associated Anesthesiologists, P.C. and Ron has been with Associated Anesthesiologists, P.C. since July 1991.